Stick a fork in it - Schaefer Advertising Co.
Here’s a riddle: What says “You’re important, come to this tasting event and here’s a bribe?” You guessed it, a foil-stamped invitation with a gold fork and mini chocolate cake inside. Client Hurst Conference Center hosted an event for local event planners to show off all their amenities, including adaptable spaces and a full-service kitchen. Since the event would include a tasting menu prepared by their on-staff chef, we decided to tempt attendees with a taste of what was to come. 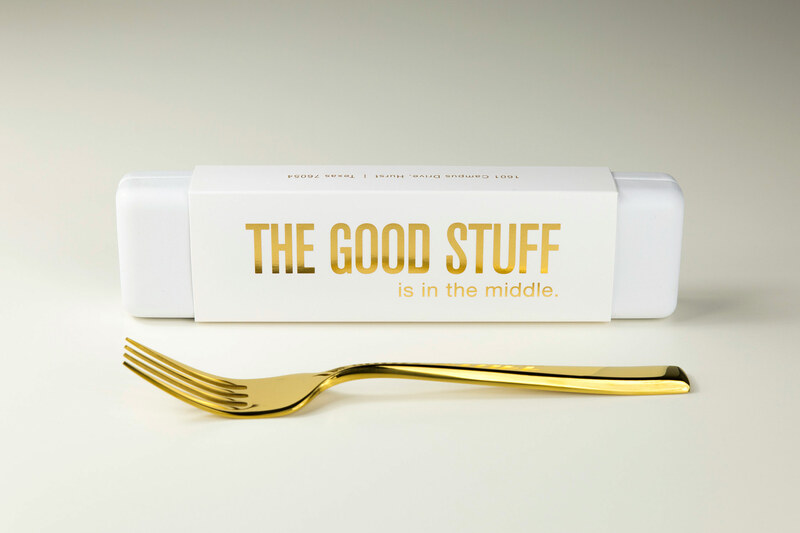 “The good stuff is in the middle” relates to Hurst’s prime location in the heart of the metroplex, but of course it always applies to desserts. Of course, we being the thorough and thoughtful partners that we are did diligently sample a range of desserts to pick the one that was most likely to attract a crowd. All in a day’s work.